Best ways to clean a dirty oven fast? I live in an apartment. I have been here one month. The oven has NEVER been cleaned and it is a mess. 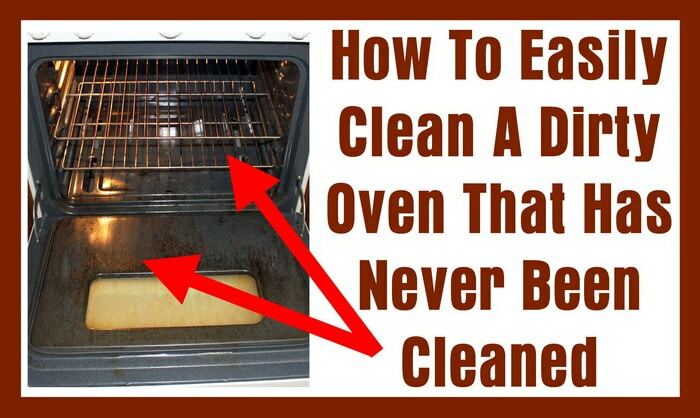 It is not a self cleaning oven. There is grease and grime buildup on the racks, sides, top, and bottom of the oven. It is really bad. There is a bad odor when I use the oven. I need an easy solution and hopefully one that does not involve heavy duty harmful cleaners. Is there a way to somehow soak the oven in a solution overnight that may make my job of cleaning it easier? Do I need to remove the racks before I clean? Can you give me some good tips and advice? Here is how to loosen the grease on the inside of the oven and racks before you clean. First: Unplug the oven from the outlet or remove power by switching the breaker off for safety reasons. Get a large bowl. (Use a mask and gloves if needed) Add a quart or more of ammonia to the bowl. Place the bowl of ammonia into the oven, close the door, and leave it inside for 24 hours or longer. How does this work? This works by the ammonia fumes loosening or softening the grease in the oven and making it easier to clean. Get some rubber gloves, a face mask, and a good quality sponge or scrubber. After 24 hours or longer, remove the bowl of ammonia from the oven. Remove any crumbs that have accumulated in the oven with a canister vacuum. Fill your sink or a bucket with hot soapy water, preferably a grease cutting soap like Dawn dish detergent. This will be the water you will use to rinse your sponge or scrubber while cleaning your oven. Start by removing the oven racks. Put the racks in hot water if possible or put them aside and scrub them off using your sponge or scrubber. In the oven, wipe the top, bottom, and the sides with the hot soapy sponge while frequently rinsing the sponge in your hot soapy water solution. Do this until most or all of the grease and grime in the oven is gone. If the grease is burnt and hardened, you can usually leave this as it will not create any unpleasant odors while baking or broiling. First: Unplug the oven from the outlet or remove power by switching the breaker off for safety reasons. Remove any crumbs that have accumulated in the oven with a canister vacuum. (Use a mask and gloves if needed) Remove the oven racks and set aside. Spray the inside of the oven with Easy Off No Fume Oven Cleaner. This is the cleaner in the blue can. Wear gloves and a mask if you prefer. Be sure to spray on the sides, top, and bottom in the oven to get all the grease and grime soaked. Shut the oven door. Let the Easy Off spray cleaner sit for around 4 hours or so. After letting the Easy Off cleaner sit for 4 hours, fill your sink or a bucket with hot soapy water, preferably a grease cutting soap like Dawn dish detergent. Wear gloves and a mask if you prefer. Next, get a large damp sponge and wipe the insides of the oven to remove the grease and grime. Rinse the sponge frequently in the hot soapy water in the sink. Any grease or grime that does not come off with the first spray application, repeat the steps and clean once again. For stubborn baked on grime, you can use steel wool pads or a plastic putty knife to remove any excess baked on grime. Use cautiously and do NOT scratch the oven surface as this will damage the inner coating and make it more difficult to clean in the future. To clean the oven racks the easiest way: Use a product called Carbona oven rack & grill cleaner. With this cleaner you put the oven racks in a bag with the cleaning solution and let them soak until clean. NOTE: It is not recommended to use Easy Off Heavy Duty Oven Cleaner. This cleaner is in the yellow can and it smells bad enough to where you may need a mask when using it. This spray can also damage parts of your oven as it is a corrosive type of cleaner. If you do use this type of cleaner, be sure NOT to get it on the floor, cabinets, counters, etc. If you want to try cleaning your oven with baking soda and vinegar, check this article here on How To Clean an Oven With Baking Soda & Vinegar. Do you have other proven recommendations to clean a dirty oven the easiest and fastest way possible? Please leave a comment below to help our other readers clean an oven fast and safe. I had the same problem, my oven and rangehood filter was disgusting and I cant believe the people before me got their bond back! Easiest method from an asthmatic who cannot use most of the above as the chemicals will cause an asthma attack (even the no fume ones!) is to use a deep enough bucket that it wont overflow when this foams up: mix of 1/2 cup bicarb in 2-3 cups hot soapy water, stir well then add one cup of vinegar – it will foam a fair bit and thats what you want – dab the foam generously all through the oven including side rails and racks and then leave it for an hour at least. Kerp the remaining contents of the bucket for later. When you go back to it, simply add a cup of hot hater to the bucket then wipe the oven out and rinse the cloth in the bucket as you go. Paper towel is good for the first wipe off too. This shouldnt involve any scrubbing and last wipe should be with a clean cloth and fresh hot water. Dry if you like with a microfibre cloth. This mix can also be used if you have a tray or bucket large enough to lay the racks rails and the metal rangehood grill flat and pour the mix on top ensuring everything gets coated if not covered, leave for at least an hour but as long as you like really and then rinse/wipe and dry. Works great on baked on bits in baking tins and to help refresh old bakeware, pots and pans. I also use this to clean my bathroom including pouring it into the toilet bowl – it will also help loosen a partial obstruction thats affecting flushing properly. Works ok to ease up grease stains off garage floors too. You could also get some baking soda paste, cover the entire oven, bake on high for 15-20 min, let cool, add more baking soda paste, let dry some, spritz with 1/2 strength white vinegar, dry overnight. Spray heavily with vinegar, let set around an hour, wipe with sponge and very warm water. Previous post: Maytag Dishwasher Error Codes HE Models – Lights Flashing Blinking – What To Check?